For many companies, the term “inventory optimization” has become more of a catch phrase than an actual reality. The idea of cutting inventory costs while maintaining the same level of customer service is rather elusive. Yet, almost all manufacturing businesses would agree that unlocking inventory costs could mean unlocking working capital that could be used in other areas of the business or even as a direct profit margin driver. Inventory, together with receivables, are essential components of the cash-to-cash cycle time. A successful inventory optimization plan often starts with the demand plan. A more accurate forecast leads to a demand predictability that closely resembles actual demand. Hence, reducing the need for an excess in inventory. For manufacturing companies to win at the inventory optimization game, it’s essential to account for possible fluctuating demand. To create a continuous process for analyzing and optimizing inventory levels. The goal for inventory optimization should be to determine what levels of inventory should be held and at which locations to prevent overstocks or out-of-stocks. For organizations looking to optimize inventory costs, this process should be defined and refined on a continuous basis based on changing market conditions. There are many schools of thoughts on whether data segmentation is needed before inventory optimization can be attained. The answer would be dependent on how easy your current data segmentation tool allows you to sort inventory attributes including SKUs and warehouse locations to determine how much inventory should be kept at each level. If your data isn’t well segmented, this vital step could influence your inventory policy and the ease of inventory data visibility for decision making. Inventory Optimization Technology Need: a readily available database that can load the inventory data based on the needed attributes. Access to real-time data from your ERP or transactional systems is vital to obtaining up-to-date information for making decisions on how to optimize your inventory levels. Implement a process to refresh your planning database with inventory data on demand from your ERP systems. Inventory Optimization Technology Need: Ensure that there is connectivity between your ERP system and your planning database for easy access to inventory data. Data should include finished, semi-finished, and raw materials. In analyzing your inventory in relation to your order lead time and order frequency, for instance, you may discover that you are stocking your inventory far in advance of the next possible order and therefore, an increase in your inventory stocking time for a particular product could, in turn, reduce inventory costs. The famous quote by British economist John Maynard Keynes demonstrates how organizations should utilize demand predictions. 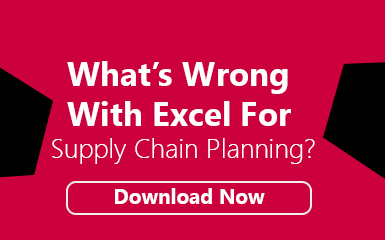 While advanced supply chain forecasting tools such as Arkieva can you give a clearer indication of demand, there is the need for real-time connection to demand changes. The measure of demand variability allows businesses to create a buffer between demand forecasts and actual demand. At this step of the process, the goal is to identify inventory stocks that cannot be accurately justified with a possible demand variability. For inventory optimization, seek to answer inventory questions including, “how are inventory levels aligning with current demand trends?”, among others. Inventory Optimization Technology Tip: To respond quickly to changing business demand, you would need to have a tool that allows you to connect in real-time to demand changes to allowing for comparisons between actual and predicted demand. Many manufacturing businesses incur inventory costs because of the inability to identify obsolete inventory or inventory that does not meet quality specifications. Keeping obsolete inventory could tie up your working capital as it increases warehouse, bill of material, work-in-progress, and finished goods costs for items that are not used. Running a Bill of Material (BOM) report to identify materials used and materials not utilized could quickly reduce soaring inventory costs. Additionally, inventory that’s off specifications or do not meet your organization’s quality standards should be discarded right away and written off to make room for stock that’s been used. For global manufacturing companies, employing a multi-echelon inventory policy is often critical to reducing inventory costs. Unlike with a single-echelon inventory control policy where each warehouse is responsible for stocking their own inventory independent of each other and of the main depot or central distribution center; multi-echelon inventory optimization takes a different approach in which decisions made on how much stock to keep at each warehouse is centrally and interconnectedly determined with the goal of decreasing inventory costs and service levels. Multi-echelon inventory optimization technology tip: Using an inventory management tool that has inbuilt multi-echelon optimization (MEIO) features should assist with accurately calculating your safety stocks while taking into account, demand and lead variability at each echelon. A key component of your inventory improvement plan should entail creating a simple way to track inventory metrics. Tracking inventory metrics assists with measuring inventory “health” and provides a basis for continuous improvement processes. Finally, your inventory optimization plan should include a continuous process review that identifies areas of improvement in your inventory management policies as well as inventory reallocation. This process review can be on a monthly, quarterly, or weekly basis depending on your specific business needs. Note: This sample plan starts with critical data connectivity and segmentation tasks. If you have those steps already in place, you can move ahead to the inventory optimization portion of the plan. The Arkieva supply chain planning suite provides growth-conscious manufacturing businesses with the ability to collaboratively create an efficient inventory optimization process by providing end-to-end supply chain planning tools for creating a linked supply chain process. The Arkieva inventory planner utilizes demand data to plan safety stock levels by SKUs incorporating demand variability, desired service levels and lead time information across an entire network. Additionally, using the fully embedded multi-echelon inventory optimizer businesses can quickly and easily compare different inventory management scenarios to allow for better inventory optimization. Ready to get started? Ask for a demo on inventory optimization.